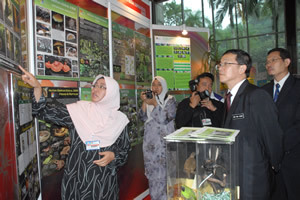 BANGI, 6 Dec. 2010 – Malaysia wants to produce up to 48,000 Phd. holders by the year 2020 for which RM350 million had already been allocated under the 10th Malaysia Plan as part of the move. The aim is to put Malaysian higher education institutions at par with world class institutions, said the Deputy Minister of Higher Education, Dato’ Dr Hou Kok Chung here today. He said A MyPhd programme was launched recently allowing for Split Phd programmes where students can be certified simultaneously by local and international universities. 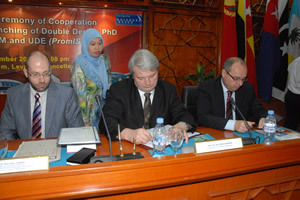 “With the recent launch of three new initiatives under MyBrain15 Programme, in particular the MyPhd initiative, the Ministry is casting a wider net, this time offering funding even to candidates outside the public universities domain,” he said at the signing ceremony of a Cooperation Agreement and the launching of Double Degree Phds between UKM and University of Duisburg-Essen Germany (UDEG). In the past the pull factors for many local universities in attracting foreign students is the cost factor but competition is becoming increasingly stiff globally. “Although most universities now rely on the cost factor in attracting international students, this cannot continue forever. We must convince them to come here for the quality of education that we provide” he said. One of the solution to remain relevant and be an institution which is world class in nature is the process of internationalisation. The collaboration between UKM and UDEG is one of such example to be established and to maintain an international presence. It will enable doctorate student to be certified by both Universities. Dr Hou commended UKM for having the foresight to establish such a global presence congratulating both it and UDEG for their foresight and proactive move. He hoped that the collaboration would result in more students pursuing the split programmes. 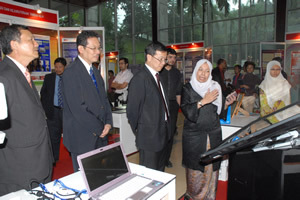 Deputy Vice Chancellor Dato’ Sr Ir Hassan Basri and Vice Rector of Research UDEG, Prof Dr. Ing. 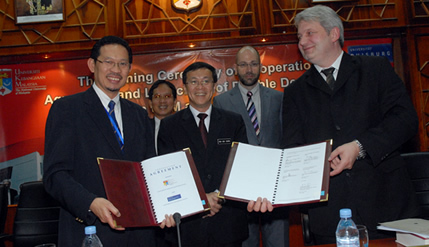 Habil Jorg Schroder signed the Agreement. The German Ambassador to Malaysia Dr Guenter Gruber was present at the ceremony.